Los Angeles, CA—A number of actresses and civic leaders wore Erica Courtney’s jewelry to a variety of awards events in California early this month. Actress Jennifer Beals wore Erica Courtney jewelry to the Family Equality Council Los Angeles Awards Dinner. She chose 18k gold and diamond fancy Imperial jadeite earrings, 18k gold and diamond coral Easter Egg ring, various 18k gold knotted bangles and 18k gold and red diamond bangles to wear with a deep cut purple dress. Jordyn Grohl, wife of Foo Fighters' Dave Grohl, was spotted at the Grammy Awards and at Clive Davis’ Pre-Grammy party in Courtney’s jewelry. She chose 18k gold and diamond crown claw earring caps with turquoise, an 18k gold and diamond Stephanie swirl band, various 18k gold and diamond Ellen bands, 18k gold and diamond Ethiopian opal drop earrings, and an 18k gold and diamond emerald cabochon ring. Jennifer Beals, left, and Jordyn Grohl in Erica Courtney. Actress Niecy Nash (photo at top of page) arrived at the NAACP 44th Image Awards in a one shoulder draped black gown, accessorized in Courtney’s 18k gold and diamond forever earrings with mali garnet drops and a peridot snowflake ring. Meanwhile, chairman of the NAACP, Roslyn M. Brock, was also seen at the Image Awards in Courtney’s platinum and diamond fleur-de-lis earring with green tourmaline square drops. 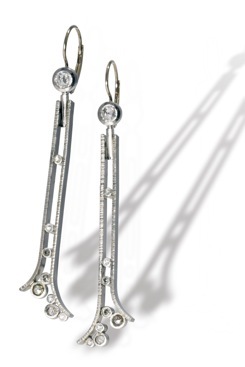 Actress Alfre Woodard wore Courtney’s jewelry to the 17th Annual Art Directors Guild Awards. She wore a colorful strapless gown accessorized with the jeweler’s 18k gold and diamond anchor earrings with citrine drops and an 18k gold and diamond round zultanite ring with pink sapphires. 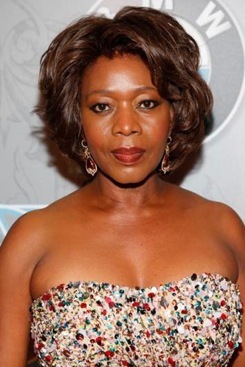 Alfre Woodard in Erica Courtney earrings. New York, NY—Penny Preville’s black diamond band and “Deco Bar” band were featured in the Beauty section of Tatler Russia’s February 2013 issue. The designer also made it into the magazine’s December 2012 issue with her blue sapphire and Harlow rings and a pair Labradorite Earrings. Penny Preville jewelry on the cover of Tatler Russia in February; right, she's inside the December 2012 issue. More images below. Top is from February 2013, bottom from December 2012. Los Angeles, CA—Kathy Griffin wore palladium “Inversion” earrings with diamonds by Elizabeth Garvin and the palladium “Cosmic Meteor” ring by D'ette Delforge of 3D Designs, to the 55th Annual GRAMMY Awards on Sunday. 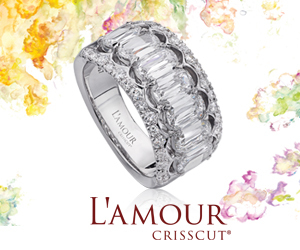 The ring features a natural octahedron diamond surrounded by round brilliant cut diamonds. She also wore the ring to the Clive Davis And The Recording Academy's 2013 GRAMMY Salute To Industry Icons Gala on February 9. Clockwise from top left, Kathy Griffin and her palladium earrings and ring. Los Angeles, CA—TV personality Giuliana Rancic wore Le Vian rings to the 55th Annual GRAMMY Awards at Staples Center on February 10. 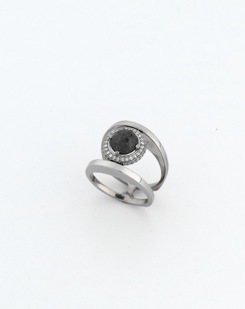 Actress Zoey Deutch wore three of the jeweler’s trademarked Blackberry and Vanilla black and white diamond rings to the Los Angeles premiere of Warner Bros. Pictures' Beautiful Creatures at TCL Chinese Theatre on February 6, in Hollywood. Giuliana Rancic in Le Vian rings. Halle Berry wore Le Vian rings in Strawberry gold with Blackberry and Chocolate diamonds and pink sapphire to the 44th NAACP Image Awards at The Shrine Auditorium on February 1 in Los Angeles. Actress Jennifer Lopez stopped to have lunch at Bouchon restaurant on January 29, 2013 in Los Angeles, wearing Le Vian’s white and Honey gold rings with Chocolate and Vanilla diamonds. Halle Berry wore these Le Vian rings. The Year of the Snake is inspiring jewelry design this year as much as the Year of the Dragon did last year. Singer Ciara wore Le Vian Strawberry Gold ring, along with 18k rose gold rings from both Demarco and Norman Silverman. 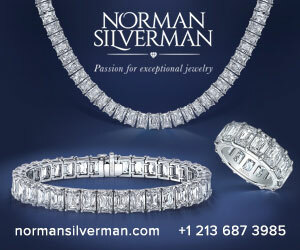 Norman Silverman also was the jeweler of choice for J. Lo that night--but with her dress slit up to there, who noticed much else? Somehow, La Lopez managed to raise a few eyebrows while still abiding by the now-famous CBS wardrobe memo not to show too much skin (no breasts or buttocks, it specified). Still, it was hard to miss the fact that she was also draped in more than 100 carats of Silverman's diamonds. She wore 10 ctw diamond stud earrings. diamond bands of 2.18 ctw and 9.76 ctw respectively, a 33.77 ctw canary diamond bracelet, a 31.30 ctw diamond bracelet, and a 33.68 ctw diamond bracelet. More Jennifer-isms: Jennifer Hudson wore Michael M. diamond drop earrings and a Demarco 18k gold and diamond cuff to the Grammys, while actress Jennifer Lawrence wore a Le Vian ring to the 'Silver Linings Playbook' Grey Goose Dinner hosted by Harvey Weinstein and Stephen Fry at Little House on February 8 in London, England.